It’s done!! Seriously!! – Nice dress! Thanks, I made it!! 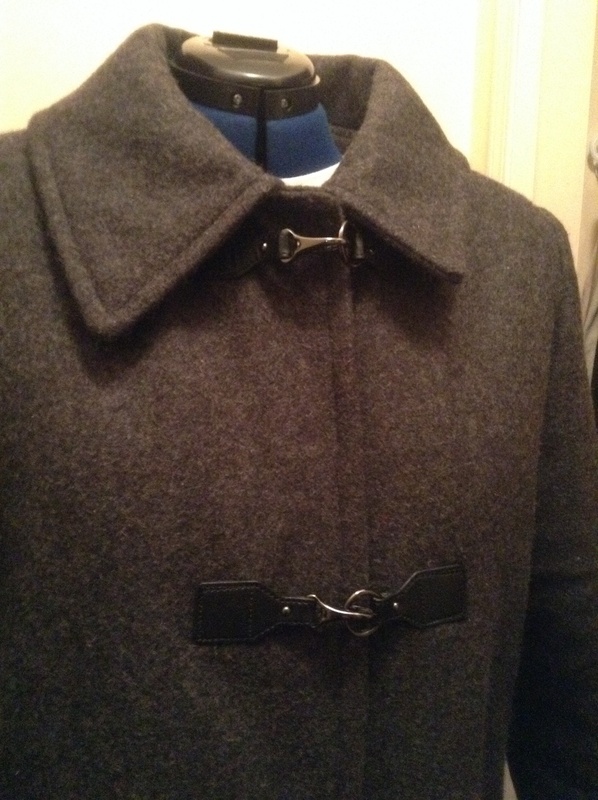 It is made of a dark grey wool Melton with McCalls M6657. As I said before I did not like that the pattern did not have a back neck facing or lining, so I pieced those together myself. Otherwise, it was a simple pattern to make! I was afraid my sewing machine, a Janome 3160QDC, wouldn’t be able to go through 4 layers of the fabric but with the right needle, thread and some slow sewing, it made it through. I pinned and held the belt together as it was supposed to look finished, seams folded in, then I top stitched it together and I was done. It was just easier to do it that way with such heavy material. I certainly wouldn’t be able to “turn it inside out”! Oh, just in case you noticed, the material in the sewing machine is different than the belt Dolly is wearing. Why? Well the “leather” belt was too stiff so I made one with the grey Melton. It was just right (Goldilocks, again! ), until I lifted my arms to put my scarf on and my belt and coat slid up to my ribs and never came back down! I tugged and tugged at it all around with no luck. 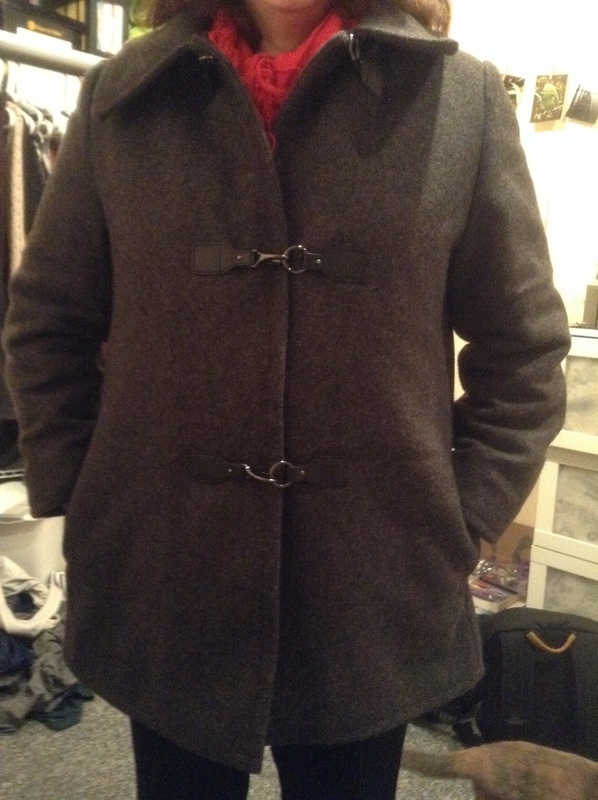 Finally I just undid the belt on my ribs and was able to get my coat down again! A funny sight! I am obviously not meant to wear the belt! … and the cozy hidden pockets. I saw this lovely pea coat up close. Our lovely seamstress was talking to me and I honestly couldn’t remember a word she had said because I was admiring her coat. How was she able to make something where no threads are to be seen. 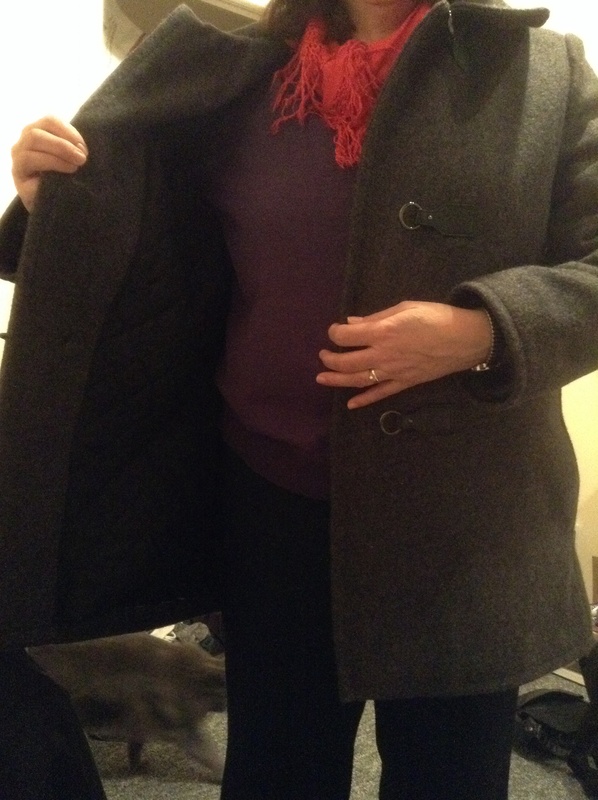 The coat lays so flat, no awkward bunching anywhere. Beautiful coat. 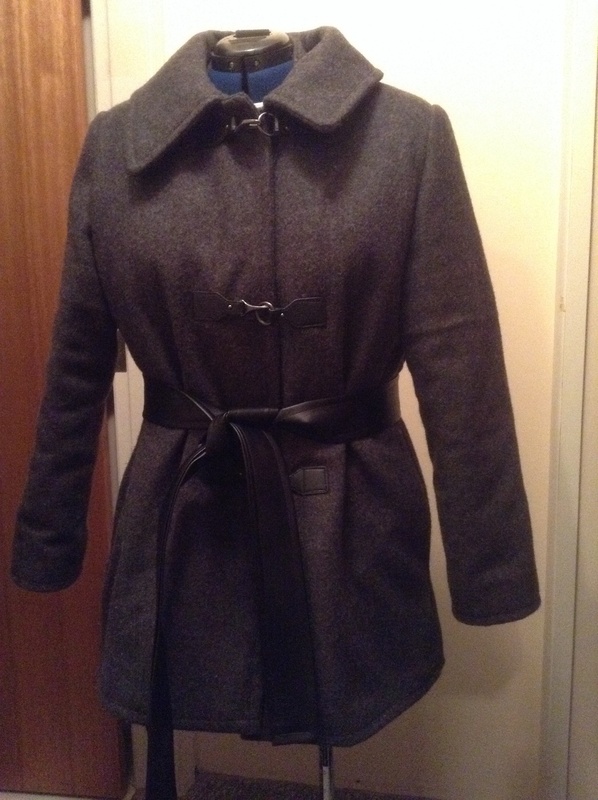 I also have the same problem with belts on coats…I don’t lift my arms. LOL. Thank you! So.. The things we do in the name of fashion – don’t lift your arms! Lookin’ pretty snazzy. You have outdone me in so many ways. Not quite, you should see the insides! I’m not the one that made her inside seams just as nice, or nicer, than what was on the outside! You are my mentor! That coat is fantastic!!! Way to go!! I vote for the knits…Life is too short, so sew what you really want first! Thanks! Ya I am thinking start with some knit T shirts and work up from there. That looks amazing! Great job on the coat. Awesome job! I might have to make you my new distress call when it comes to sewing disasters! Seriously nice work here. Thank you, but I have had plenty of disasters too! 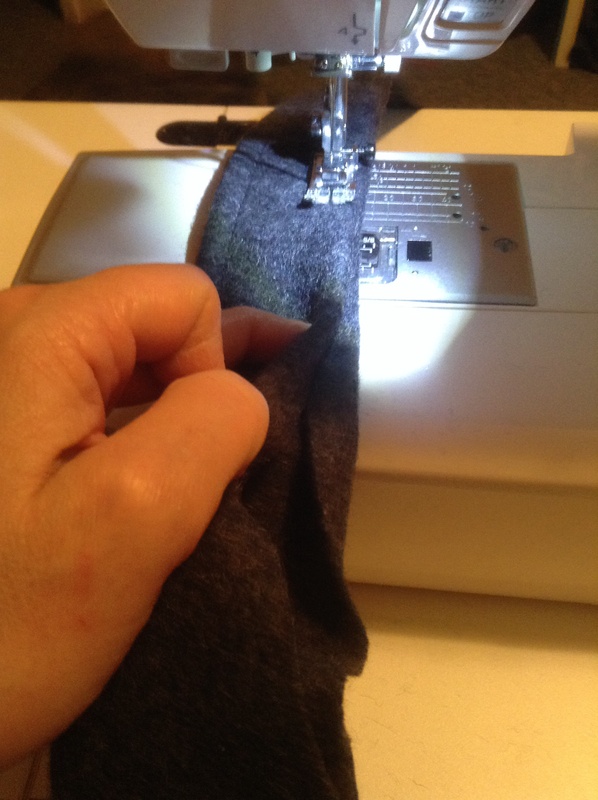 Makes me want to learn how http://accidentalseamstress.wordpress.com does her magical redo’s! wow! I can’t wait until I’m this good! Wow, very impressive! Nice goin’ kiddo! Your coat is great. I love the toggles. The whole thing just screams quality! Wow, great work. I love your choice of fabric and those closures rock! Now I want to make a coat! You know, I replied to you… Then it was lost, erased or deleted! Help I need an IT guy! Anyway, I now thank you for reading my blog and your nice comments! Wonderful jacket! Great job! I like the closure.